It’s going to take a bit of explaining to tell you how this dish came to be. First, some beautiful, fresh things like purple hull peas, a butternut squash, cucumbers, sweet peppers, and cherry tomatoes had just arrived from Farmhouse Delivery. If you’ve never tried purple hull peas, they’re similar to black-eyed peas with a slightly milder flavor. When they’re freshly picked, they cook to a nice state of tenderness in about twenty minutes. I’d been holding onto a recipe from Saveur magazine just waiting for some fresh field peas to come into season so I could try it. That recipe was from a story about Senegalese cooking that included dishes made with black-eyed peas, okra, and hot chiles. The recipes were perfectly suited to what grows well here. So, from that story, I wanted to try the Saladu Nebbe which is a black-eyed pea salad with lime juice, parsley, tomato, cucumber, bell pepper, and habanero. I made it with purple hull peas rather than black-eyed peas. On a completely different topic, I’d also been looking longingly at some little potato galettes from an old issue of Living magazine. I believe the page for these galettes was cut from a 2003 issue and the exact recipe isn’t online, but they’re simple, small rounds made up of very thin slices of potato. 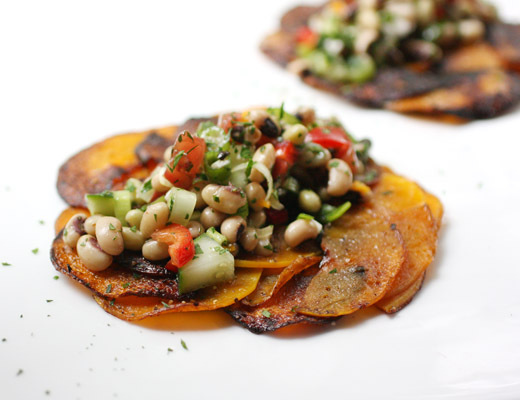 I got a crazy idea to try making the same thing with butternut squash instead of potato and then imagined the big flavors of the purple hull pea salad would marry well with a sweet, crispy galette. And, just like that, the dish you see here was created. I admit the galettes would be easier to make with potato than with butternut squash. The squash slices didn’t stick together while cooking quite as well as potato slices would. After flipping each galette, I did have to push a few squash slices back into place to keep the round shape. I started by peeling a butternut squash and cutting off the straight section. That straight part was cut in half lengthwise and then thinly sliced on a Benriner. Olive oil and butter were heated in a large skillet, and a round galette was formed by layering the squash slices in a circle in the skillet. Each galette was made up of two layers of squash slices. The galette was seasoned with salt and pepper, and a smaller skillet was set on top of the galette to keep it very flat. After a few minutes, the galette was flipped, a few squash slices that slid out of position were pushed back into place, it was seasoned with salt and pepper again, and the small skillet went back on top. For the salad, the purple hull peas were cooked in water for about twenty minutes and then drained and set aside. The dressing was made by whisking chopped parsley and lime juice while drizzling in canola oil. Then, chopped green onion, sweet peppers, tomatoes, cucumber, and a seeded, finely chopped habanero were combined in a big bowl. The dressing was added, and the salad was seasoned with salt and pepper. After tossing to combine, the salad was left to sit at room temperature for about an hour so the flavors could get acquainted. This dish might have come about in a less than obvious way, but I was happy with the result. The finished galettes were crispy on the edges, tender in the middle, sweet, and buttery all at once. And, the fresh, bright, and spicy flavors of the salad were a good match. I always find good ideas in my recipe files, and who knows what they'll inspire next. 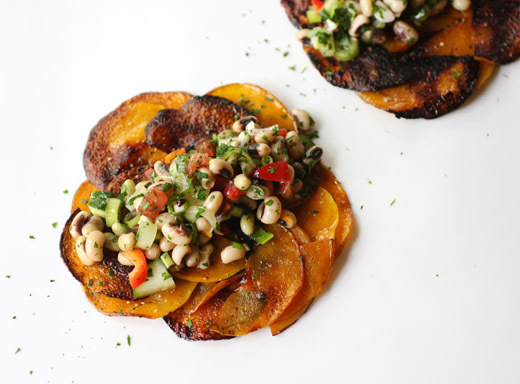 This is such a creative way to serve beans and squash. Who knew they could be so elegant? I adore this !!! So beautiful and creative! This is absolutely beautiful! 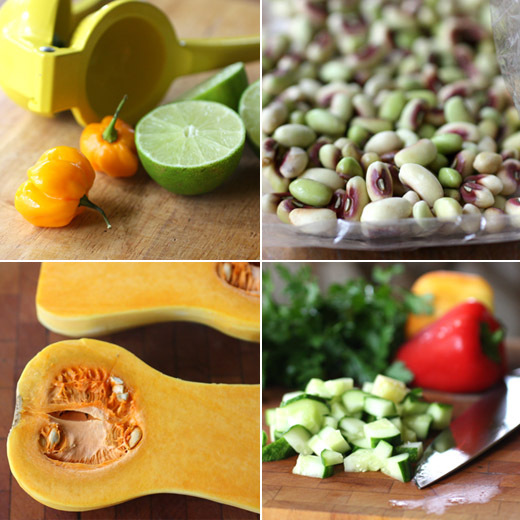 I have been experimenting with squash and beans myself this month! And your 'problem'(in your profile), sounds much like mine.I will be back to seach through your recipes. Really nice. I don't believe I've ever seen a squash galette before, and I've certainly never made one. I like the idea - potato galettes are pretty doable, though one does need to pay attention. Sounds like the squash ones are a bit more difficult. Anyway, really nice dish, great presentation. Thanks. Such a fine gourmet pea salad! Love these thinly scalloped butternut too. Gorgeous dish - the presentation is fabulous. Love anything with squash! i can't help but ooh and aah over this, lisa--what a lovely dish! Gorgeous dish with some of my favorite foods. That squash looks amazing! Your creatively is fabulous. I love how you wandered from one magazine to another not only marrying ingredients but cultural flavors as well. They look adorable and I imagine that is how famous chefs come up with some of their combinations of ideas! I make the galette with sweet potato and sometimes I mix the with potatoes. Your combinations with the pea salad is gorgeous!!! a lovely presentation. What a lovely dish! I can just imagine this as a starter for a dinner party. Pinning now! This is just beautiful. It has such a nice balance of comfort food and being on the lighter side. A beautiful creation! Tasty and so well presented. What a gorgeous presentation! Lovely! This is such a great idea! I love the presentation and the medley of gorgeous colors. This would make an impressive appetizer. Lisa, your galettes are gorgeous! And what a yummy, unique topping...I know I'd love it! And thanks for letting us know that the slices don't hold together as well as potatoes...I wouldn't have thought of that, but it makes perfect sense. You make the most interesting recipes. I didn't know anything about Senegalese cuisine until today. What a great dish to prepare! I love the idea, Lisa. It's the flavors that count in the end, but I know what you mean about shoving things here and there to get a good foodie photo. Love the idea of a savory galette too. Interesting purple hull pea...they look similar to black-eye peas, just that little purple hue that makes them kinda unique? This is a very unique dish! What an amazing and beautiful galette! this is such a unique and creative dish! sounds and looks fantastic! even thought i wasn't sure about the compination of the peas with the squash i've tried it this week. it was so so so good that i've repeated it already. thank you for the great recipe!! !